You could almost sing the words tavče gravče (tavché gravché), also called fasoulotavas. 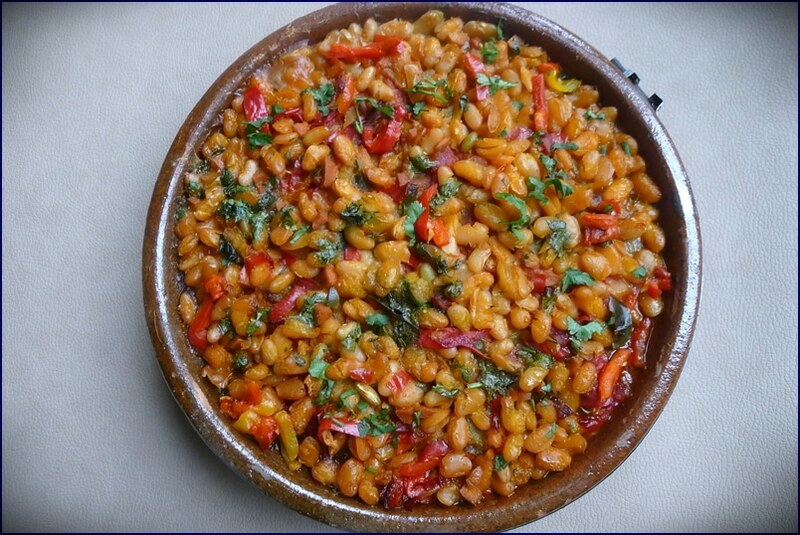 It is one of the most traditional dishes of Macedonia and Greek Macedonia. It is a dish that is also found under the same names in Bulgaria, Greece, and Serbia. Тавче гравче (tavche gravche) in Macedonian or Φασουλοταβάς (fasoulotavas) in Greek, both mean “beans on a tava”. A tava is a skillet or a frying pan. 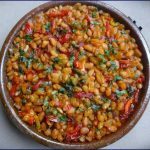 This dish consists of white beans, preferably fresh and is found in almost all restaurants and Macedonian homes. Tavče gravče is cooked and served in a terracotta container and has the particularity of being first cooked on the stove and then simmered in the oven for several hours, at very low temperature. In Macedonia, it is prepared every Friday for lunch, with no exception. 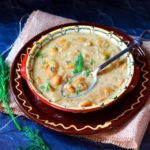 The main ingredient of tavče gravče is white bean and anny variety of white beans can be used to prepare this dish but, in Macedonia, people say that nothing beats the Tetovo bean. Tetovo is a city in the northwest of Macedonia, and the tavče gravče clearly defines the identity of the entire Tetovo region. 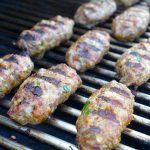 You can prepare the tavče gravče with meat: with lamb, just like in dounguouri soko from Niger or with sausages, like the famous cassoulet of French cuisine. I chose to make the vegan version. Macedonia is located in the heart of the Balkan peninsula, has no outlet to the sea and shares borders with Albania, Bulgaria, Greece, Kosovo and Serbia. It is nicknamed “the pearl of the Balkans” but it is not the only one and we should rather say “pearls of the Balkans”. The Balkan countries include: Albania, Bosnia and Herzegovina, Bulgaria, Croatia, Greece, Italy (Trieste Province), Kosovo, Macedonia, Montenegro, Romania, Serbia , Slovenia, Turkey (Eastern Thrace). What is known as “the pearl of the Balkans” is only a subtle blend of essentials from Croatia, Montenegro, Albania and Macedonia. Traditional cuisine is a very important part of Balkan culture. The different countries that make up this region each have a culinary tradition very much based on the culture and historical context that influenced each region. Macedonian cuisine is very rich and varied, a tasty alchemy of gastronomic influences. Given the multiplicity of people who have traveled through Macedonia over the centuries and the shops that housed the bazaars of Skopje, even the cuisine is a true bazaar of flavors, a mix of cultures and tastes. The flavors are diversified and the dishes unite those of the Balkans, Greeks and Middle Eastern, especially the Turks, whose tradition has left its mark in the wide use of spices to season all dishes, and to a lesser extent the Italians, Mediterranean and Hungarians have also left their mark. 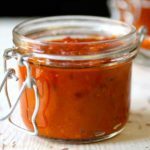 The Macedonian culinary traditions are many: meat, which is prepared in a thousand ways but especially on the grill, fish, the most elaborate dishes, cooked in the oven and on a fire, such as tavče gravče, through the various sauces and tasty condiments, among which you will find the very popular ajvar, as well as the lutenica, which can be compared to the harissa of the Balkans or the pindjur, halfway between Tunisian eggplant ajlouk and the Moroccan taktouka. In September, the preparation of all these condiments is an event in itself in every Macedonian family. The markets are mostly colored red and green, like the tomatoes and peppers that compose them, and all the neighborhoods feast on roasted peppers. Delicate, sweet or spicy food, is stored for the winter, but it is so delicious that it generally does not last more than a few weeks! In Macedonia, the relatively mild climate provides optimal growing conditions for a variety of vegetables, herbs and fruits. As a result, the cuisine is quite rich and varied. 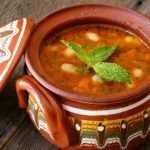 The main foods are therefore meat and vegetables, which are found in a generous dish such as one of the national dishes, turli tava, pieces of meat (pork, veal or mutton), potatoes, tomatoes, onions, eggs and paprika. As for the tavče gravče, in Macedonia, people say: “He who does not try does not know”! I therefore invite you to try this dish, so you will know. You will know that it is delicious! Tavče gravče is a national dish of Macedonia. 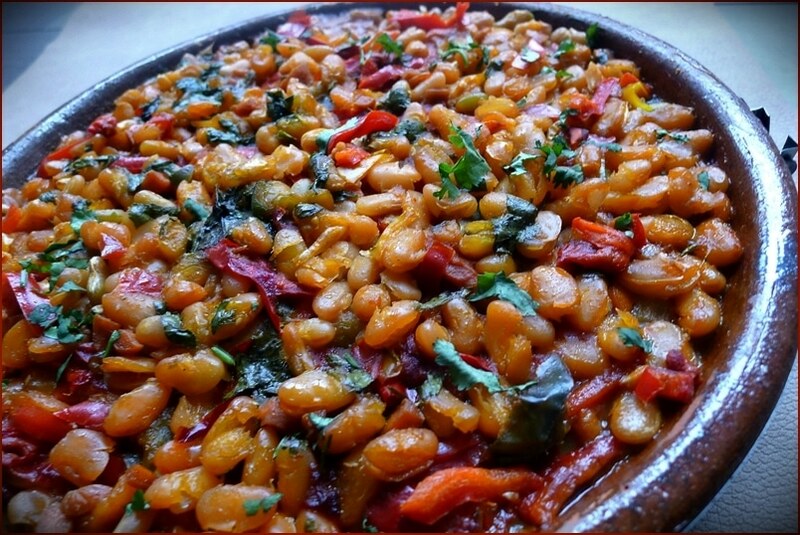 It is composed of beans and other vegetables and prepared in a skillet. 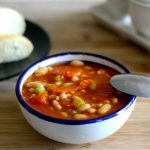 Soak the beans for 6 hours in boiling water and ½ teaspoon of baking soda. Wash the beans and blanch in boiling water over high heat for 15 minutes. Drain. In a stewpot, sauté 2 garlic cloves in a quarter of the oil. Add a few slices of red and yellow peppers, half of the paprika, and one chili pepper. Pour the beans and ⅓ of chili powder. Salt. Cover tightly with water and cook 30 minutes over medium heat and 30 minutes on low heat. Once the beans are cooked, drain and reserve the cooking liquid. Put aside. In the second quarter oil, sauté the onions. Add salt, the second third of chili powder and the flour. Simmer for 10 minutes. Put aside. In the 3rd quarter oil, sauté the last two cloves of garlic, the remaining strips of bell peppers, the other half of paprika, and the second chili pepper for 15 minutes. Put aside. Preheat oven at 210 F.
In an earthenware pot or a glass baking dish, add the fourth quarter of the oil in the bottom. Add all the above preparations in layers ending with beans on top. Cover with the reserved cooking liquid, sprinkle chopped cilantro and mint. i hope you will check it out and try our version. here, in macedonia, cooks at home and in restaurants, rarely put chopped peppers. usually it is one or two whole long green or red peppers put on top of the beans. 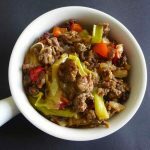 thanks for sharing so many diverse recipes from all over the world. 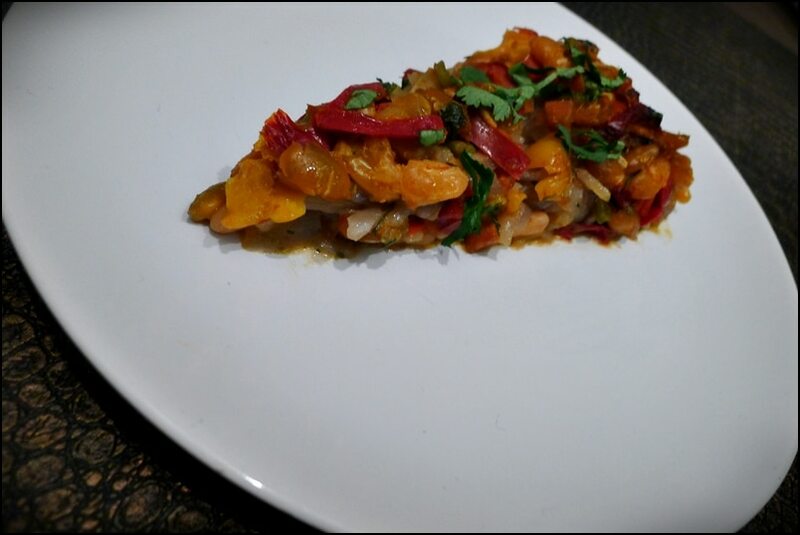 Wow, thanks so much for sharing your recipe Bojana. I love it when native people comment on our blog as we really strive for authenticity. So, it looks like we almost got it right, but you’re saying that 1-2 whole peppers would be placed on top. Are we talking about cowhorn (hot) or bull’s horn (sweeter) peppers? Are they fried before, or cooked with the beans? Either can be placed over the beans, raw, and they will bake with the beans. Or sometimes a variety of pepper we call “embroidered”, because of the striations across the body of the pepper. Hi. Just wonderin’: I found this in gluten free section, but it includes all purpose flour. Was this a mistake?